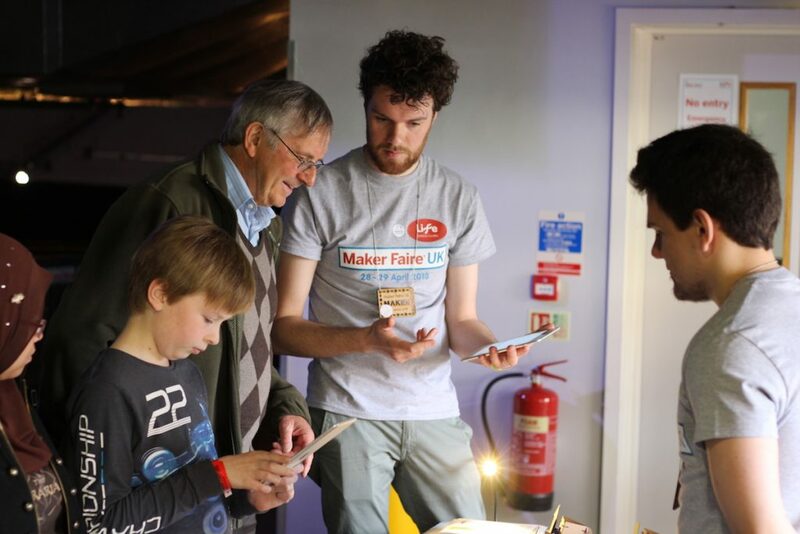 On the 29th and 30th of April, David Verweij (PhD Student at NorSC) hosted a stand on the UK Maker Faire 2018 at the Life Science Centre in Newcastle upon Tyne. Here, we presented the first iteration of ‘Domestic Widgets’, a project that explores how the Internet-of-Things can help us in our everyday lives. These Widgets allowed visitors – rather than the designer or researcher – to easily make use of (public) data that is widely available around us. As such, we can see what kind of data might be found useful, how you would like to represent this data, and how this representation is used in everyday life. 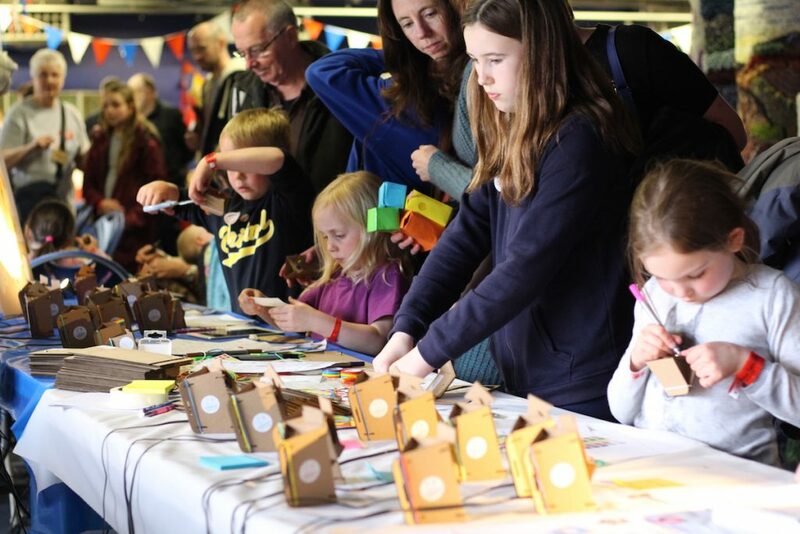 A public event such as the UK Maker Faire was very exciting, as we engaged the general public with the product to improve its design and service; and we gained input from the end-users to better inform the design process and study design. The stand hosted 20 pre-made working Domestic Widgets, a (related) activity for children, some question cards to collect written feedback from visitors, and promotional materials such as stickers, flyers and a large poster. Two colleagues (one PhD Student, one Research Assistant) from Northumbria University assisted in occupying the stand, inviting visitors to participate in the child activity and to discuss the project. The presented Widgets were operational, and could be controlled using one of two iPad’s, through either typing or (if environmental noise allows it) through speech. The child activity consists out of a smaller and simplified version of a Domestic Widget, that needs to be folded and assembled (with a split pin), after which it can be decorated to your heart’s content. The setup design accommodated for a children’s activity, primarily to draw families towards the stand. Unexpectedly, this was more successful than anticipated, as it seemed not too many (young) children activities were organized. 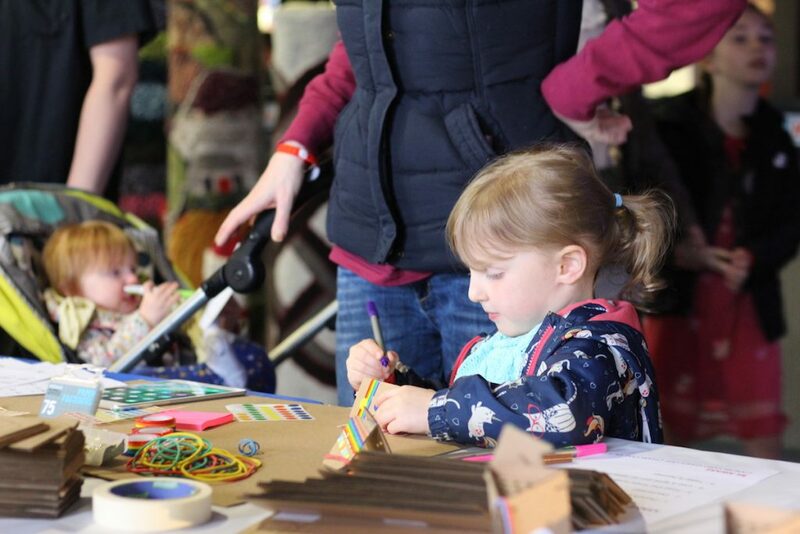 Our children’s kit allowed for folding, drawing and decorating, which suited the Maker Faire public very well. As such, a lot of families with children visited the stand which allowed for in-depth discussions on the application for their everyday life – particularly with the parents. In addition, some children were also joining in on these discussions, which revealed interesting and inspiring results! Our next steps are to improve our first iteration of the Domestic Widgets, and to continue joining promotional and reflective activities to improve our reach.